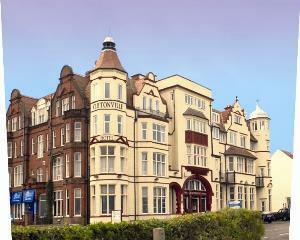 The Cliftonville Hotel HotelBuilt in 1897, the Cliftonville Hotel occupies the premier position on the Cromer seafront and all 30 en-suite bedrooms benefit from stunning views of the sea and town. Many of the original Edwardian features remain, including the 'Gone with the Wind' style staircase in the main lobby and beautiful stained glass windows and doors, as well as the classic Minstrels' Gallery. Now in the 21st century the hotel has introduced an all day coffee shop and bar with a wide selection of speciality teas and coffees, pastries and light meals. Bolton's Bistro specialises in fresh fish dishes as well as offering a variety of meat and vegetarian options, providing guests with a more relaxed and informal atmosphere in which to dine. The Ballroom Lounge reserved exclusively for guests is decorated with hand painted murals and provides an area of calm tranquillity at the end of a busy day. Exec. Double sometimes limits bookings to 2 or more days. Superb cliff-top location with good sea views. Good restaurant serving excellent food. Had one issue with size of standard single room booked - couldn't open any windows and it was so hot I had to have a fan on all night, but after complaining to staff next morning was moved to larger single room which was better in every respect and enjoyed a better sleep. We brought our dogs with us, and they were treated very well - they had their own evening meal, and we could take them in the bar area when we ate our meals.